Celebrities get paid an incredible amount of money to promote products on social media. The Kardashian sisters are probably the most visible face of this phenomenon, having all put their names behind weight-loss products and pharmaceuticals on multiple occasions. It’s an ethically problematic form of marketing, and it raises all sorts of questions about disclosure and transparency. But until recently it was limited to those with massive followings on social media. But that all changed today with the release of Scoutsee for iPhone. 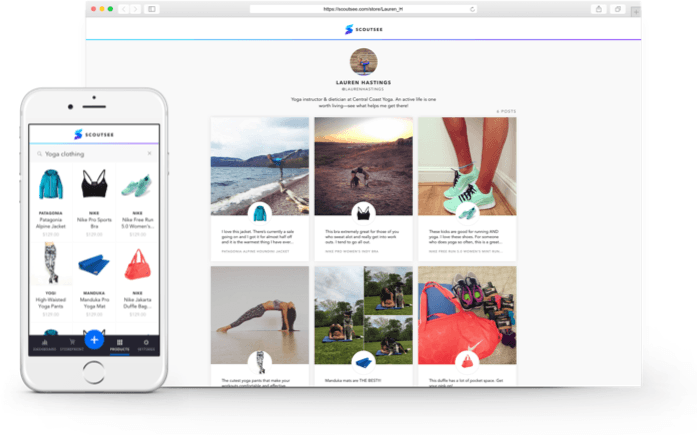 Put simply, Scoutsee is a platform that lets you promote specific products on your personal Facebook, Twitter, and Instagram profiles, in exchange for a cut of the sale price of that item. The percentage paid varies from as little as 6% to as much as 12%, and is paid directly to the user’s bank or PayPal account. You can see a demonstration of the product below. Powering this is Scoutsee’s own patent-pending technology, which combines proprietary link structures with a product catalog and secure payment gateway. The products sold come from a number of big-name brands, including Amazon, Rakuten, and eBay. Although it likes to bill itself as the “first affiliate marketing platform for social media,“ Scoutsee isn’t not the first company to leverage people’s personal brands in order to sell products. As early as 2008 there were products like Be-A-Magpie, which algorithmically determined how much a Twitter account was worth to marketers, and then would periodically post adverts. This is a new take on that model. For starters, it allows people to precisely be as aggressive with their marketing as they want. If someone just wanted to plaster their entire presence with adverts, they could do that. But that’s probably not what Scoutsee wants. “It takes a lot of time and effort to build an honest and engaged following,” said Scoutsee CEO Tom Kwon. Scoutsee launched earlier today. While it’s too early to tell what what it will look like when it gathers traction, I must confess there’s something about it that makes me feel really uncomfortable. When somebody posts something to Twitter, there’s an expectation that the sentiment expressed is what they actually believe, and their opinion isn’t being influenced by the potential to personally benefit. But Scoutsee fundamentally undermines that. It has the potential to turn us all into college students, trying to flog Herbalife or Cutco knives to an increasingly shrinking group of friends, and I don’t like that.